Beans are super food! Not only are they a great source of fiber and protein, but they are very filling, they are inexpensive and so versatile! You can have a some beans and try roasting beans, mashing them, incorporating them into salads, main dishes, and even turn them into a dip! There are so many things you can do with beans! Getting your kids to eat beans is so easy when you roast them! 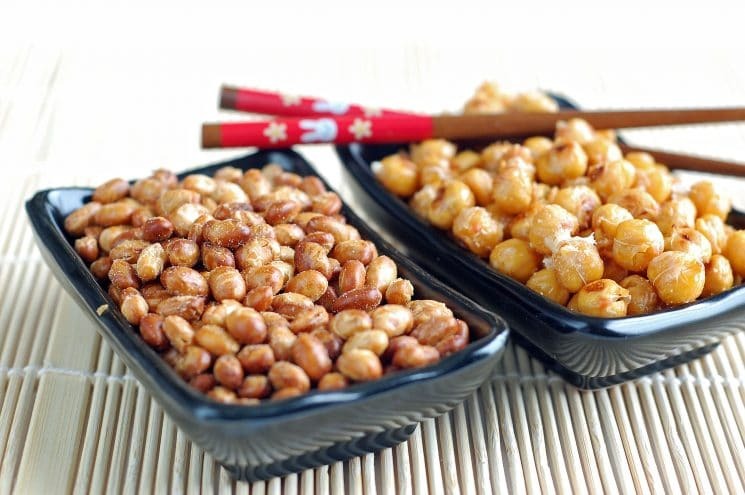 We’ve always enjoyed roasted soy nuts, but we really love roasted chickpeas. With 15 grams of protein per cup, you can’t go wrong! We eat them plain like popcorn, but we also like them mixed with trail mix. To roast them, it’s very simple. 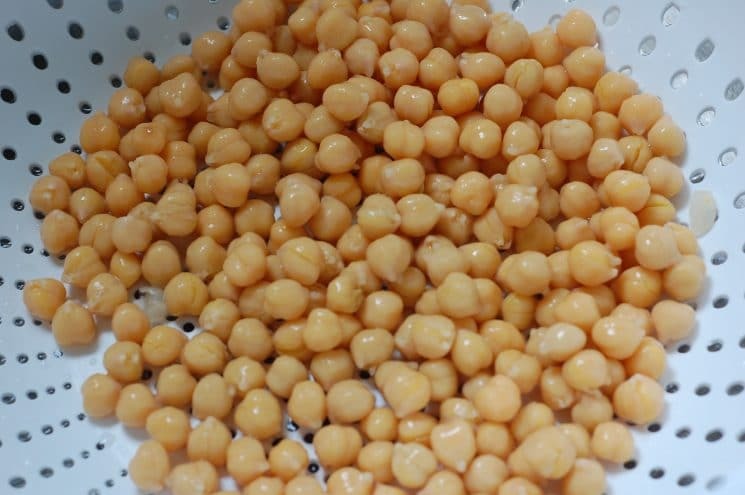 First, drain a can of chickpeas, also called Garbanzo beans, or start with cooked beans and rinse them well. Then, cook them in the oven at 400 degrees for 30-35 minutes. This snack is super easy to make, and super healthy for the kids! They can eat them plain, you could sprinkle them on salads or add them to trail mix! People like to make these with a variety of seasonings. You can make them spicy with some chili powder, you can make them sweet with some cinnamon sugar, or add some garlic salt, onion powder, etc. Are your kids eating beans yet? 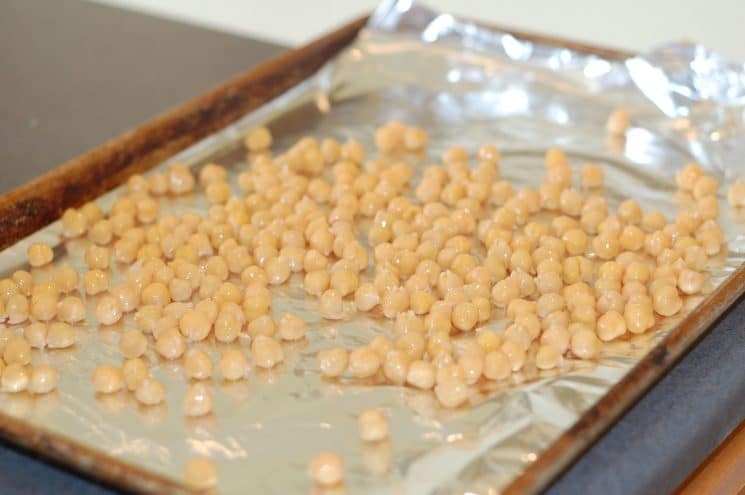 Preheat oven to 375° F. Drain and rinse chickpeas, then pat dry with a paper towel. 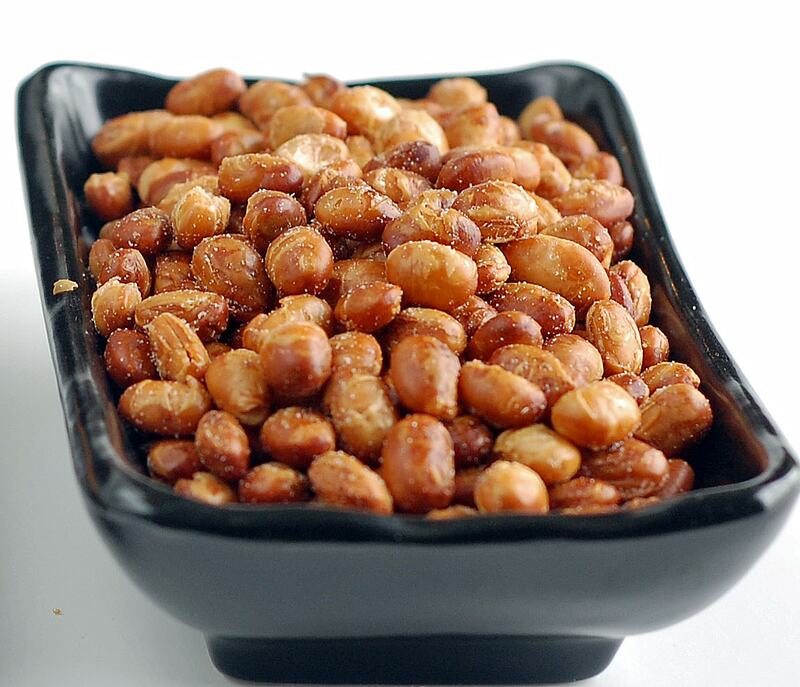 Arrange chickpeas in a single layer on a baking sheet and roast for 30-35 minutes, shaking the pan every ten minutes. They will be golden brown and crunchy on the inside when done, not moist. Watch carefully so they don’t burn. In a medium bowl, combine the salt and garlic powder. 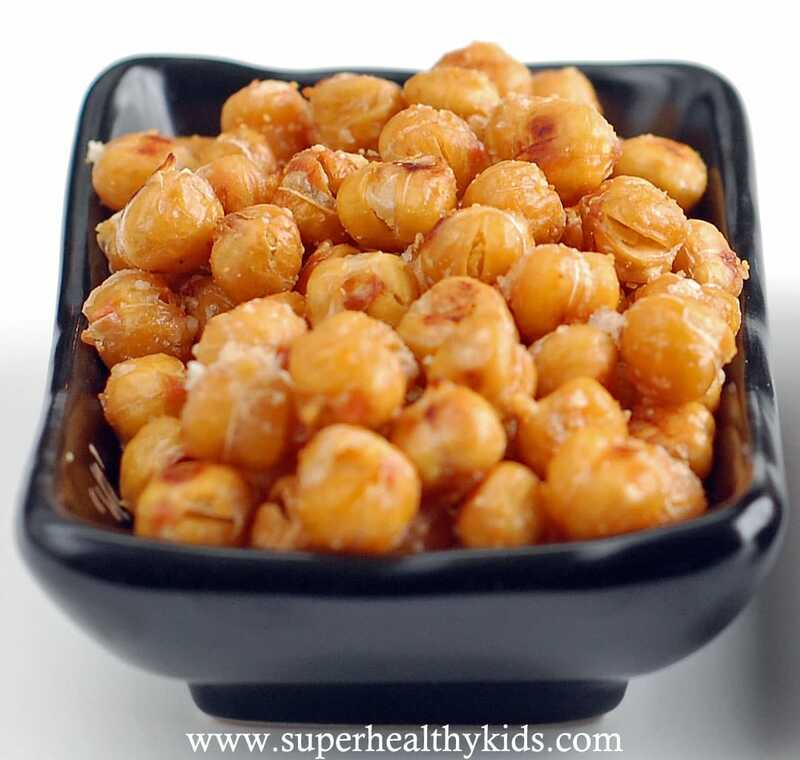 Remove chickpeas from the oven when done and spray with cooking spray. Immediately toss with seasoning while hot. I should try this again. Every time I try roasting garbanzo beans I end up over cooking them. Not a good thing. I will have to try these again too. I tried a marinated version, which I liked, but my kids didn’t like the flavor much. They love parmesan so hopefully they will give them another shot! I bought some dry soy beans a few months ago but haven’t used them because I need a good recipe. Any ideas? The roasted chickpeas look really good. These look good. I love them with a little garlic salt. Do you mean the roasted soy nuts? Or do you have raw soy nuts? 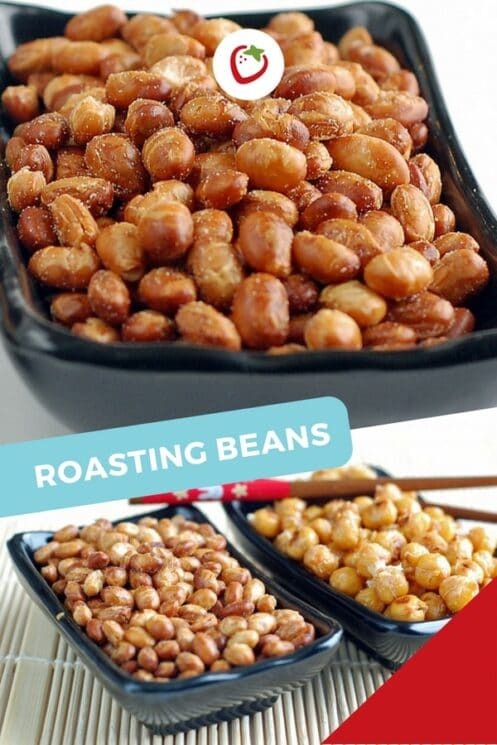 For raw soy nuts, soak them first for 8-10 hours, and then you can roast them. I am going to try these with some honey, as I dont have any parmesan, but will stock up tomorrow and try with the cheese as well! These look good, and I’ve had a can of chickpeas in my cabinet for ages! Think I’ll give it a try. My youngest loves beans and has ever since she could get her hands on them. My oldest not so much, but we keep trying! This is almost same as our Indian version. Heat little oil in pan, add chopped onions, little red chillis, then add beans. cook closed with little water if needed. Add salt & little shredded coconut . Yum!! My kids love beans, but I love this idea. And I want to question it’s possibilities… Would this work on soaked, dry beans? Any thoughts on roasting cooked dry beans this way? Tried it on Great Northern, black beans and kidney beans. They burst open at drying temp of about 220 degrees. Good flavor. Will try again and get back to you in ten years. I haven’t tried it, but I’m assuming whether you cook the beans yourself, or buy them already cooked (canned) it should be the same. Wow! That sounds good Selvi. That’s our motto Gretchen.. Keep trying! Everything is good with parmesan cheese.. roasted broccoli, noodles, popcorn, and nuts! I actually wish I had cooked mine longer. 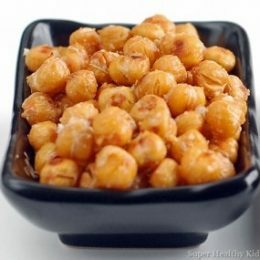 I’ve done soy, but garbanzo is such a great idea! Would you consider sending this in for the Magic Bullet contest/giveaway on my blog? they’d be perfect for the event! Excellent tips, even being from 2010 remain very current. I found your site fantastic, beautiful design, I will start to accompany you even being Brazilian! i wanted to ask you to look up canola oil..
thank you for this blog i’m loving it! Great flavor! We did sea salt, garlic powder and fake parm cheese. Only wish they were crisper and crunchy. Some were but most were not. Maybe longer on lower temp? Sounds yummy! I love chickpeas. I’ll be trying this for sure. What should the end texture be? I feel like I didn’t roast mine long enough (30min) as they weren’t crunchy or crisp and instead were kinda gummy. I tried this again, kept it at 30 minutes, but increased the temp to 425. Most of them were crunchy for me. Are you drying them well before you begin to roast? I love roasted garbanzo beans but every time I try to make them I end up with them exploding in the oven. I wish I knew what I was doing wrong. hand more pins of the slot reels you bet and gamble on. Super Slots prides themselves on their unique promotions they offer players to keep them coming back. I have tried but they last roasted for a day and thee rest they became mushy/soft next day. What am I doing wrong!? Help!!! Hi Alex – You may not be doing anything wrong. They are crunchiest the first day, and then they start to lose their crisp. I just wouldn’t store in an “airtight container”. Leave them in a bowl on the counter and they will stay a little crispier. My inlaws buy the dried chick peas and roast them. They soak them in water until they plump back up, then dry them off and roast them in the oven….they taste great! I was wondering if you know how many carbohydrates are in there. Im a diabetic so need to carb for everything I eat. Thanks! This is an awesome recepie!! from now on, i will follow your recepies!!! This is not that healthy if cooking with olive oil. Olive oil turns into a trans fat at high temperatures. Cooking it with coconut oil if better! Could you do this with all beans? @Jaimee I’ve only tried it with chickpeas. Other beans somehow don’t seem that good! I’ve used Great Northern white beans with Indian spices. They were better than the chick peas I usually roast. The texture was light and crispy as opposed to hard and crunchy. Both are great and addicting! Looks great! How long are they good for, where should they be stored? I love them with a little garlic salt. My girls like them with a little cinnamon and sugar. Hi, I don’t like using canned chickpeas. I have a bag of dried ones though! Do I need to cook them first? Yes Dana- they would need to be cooked first! I’ll try to be a delight ! They are always crunchy for me Raquel- I’m not sure how to trouble shoot this. Did you start with canned beans? Were they dry before you started roasting them? My 1st batch wasn’t done enough either. Now after 20 minutes at 400 degrees, I lightly stir them around on the cookie sheet and put them back for another 10 minutes. Then I repeat and sample every 5 minutes until I get the desired crunchiness. They’ll turn out like the dried or roasted product you buy in the store. Watch them close towards the end – at 400 degrees they can go from done to burned pretty quickly. After they are fully cooled, they’ll store in Tupperware for at least a week. Do you store them on counter for up to a week or do they need to be refrigerated? ?? On the counter is fine Jennifer! I would like to know the temperature to be roasted at in a convection microwave. This recipe is yummy. I’m confused. The pictures don’t match the recipe. The pictures say to dry the water off of them, but then coat them in olive oil and spices and THEN roast them. However, the actual recipe you can print says to dry them, roast them, THEN spray with spray (no mention of olive oil) and then toss them with spices. I assume the printed one is correct since you want them dry, but wanted to be sure before I made another batch.. It shouldn’t matter- I’ll go back and edit, but this recipe is very forgiving. I’ve done it with just spraying, just drizzling oil, and both. You really can’t mess it up. I tried these this morning and it was a disaster! I towel dried the beans, tossed with olive oil and placed in the oven. After a few minutes they were literally popping all over my oven! Did anyone else have this problem??? I really want to try these. Now I have to clean my brand new oven once it cools ? Oh no! this is possibly the most forgiving recipe, and I’ve never done it the same twice. So, I’m not sure what the problem is. Are you using Fahrenheit or Celsius? We’re on Fahrenheit. Fahrenheit. I followed the directions but in other posts i found online I saw maybe the oven was too hot or too much oil or because the skins were on. I’m not sure but I’m a little nervous to try again. If I loosely put foil over the top would it hinder the roasting process? It wouldn’t hurt Angie! Definitely a good idea, considering your first attempt! Yikes! I had the same issue with exploding chickpeas. My Owen is a mess now. Did you figure out how to do it without them exploding all over? This is a problem for sure. We have some very old recipes that have gone through several different edits. I’ll take a look at this and see if I can decide the best one to use. Parabéns pelo texto, adorei o site, já está em meus favoritos, não tinha encontrado ainda um site com esta informação de uma forma fácil de entender. I love these! I think they will need to grow on the kids, but regardless, they’re going into lunch boxes this week. The oven roasted version didn’t come out well, but I sautéed these in some healthy oil and they’re fabulous. I tried some paprika and chili powder to add color. My 17 month old eats them like popcorn. I didn’t get them crunchy, but I’m putting them in my lunchbox anyways. I added paprika instead of garlic powder. It was delicious! I used the stovetop method and added salt and pepper. This is my second try as the oven didn’t work for me. The stovetop was better but they were still soft. The kids still thought they were great. I didn’t find this recipe enjoyable. The beans were just hard and tasteless. I like to season my roasted beans after because I think they have more flavor that way. My whole family loved these! They turned out nice and crispy, possibly because I left them to dry on the counter for about 2 hours before baking them. I think you should be able to pan fry them with a top since they pop. Using olive oil of course. But if you do the oven thing you should cover them up with foil or use a oven safe pot with top. Then at least if they pop the top will keep in the pot.